At Second Street: Who ya gonna call? Yeah! I'm all done with costumes! I was all set to make my son a robber costume as he requested, when he saw a commercial for Ghostbusters and begged me to switch. I had no problem with the switch, as I knew this would be a lot more fun to put together. We are both thrilled with the outcome. I made the jumpsuit from a dress I found at the thrift store. I cut off the bottom and made a pair of pants using his pants as a pattern. Then I sewed the two pieces back together again. 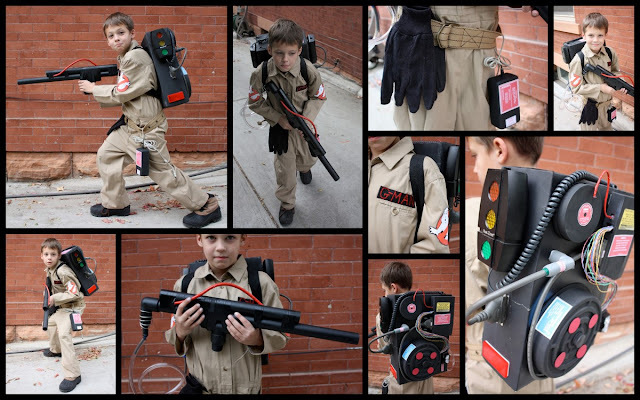 I added a name badge and a couple Ghostbuster patches made from iron-on transfer paper. For the pack, I started with a diet coke box. I made slots for straps and stuffed an old back pack inside. I spray painted it black and added several accessories with hot glue and mounting tabs. I found random things around the house, garage, the dollar store, and the thrift store to make up all the components. After I spay painted everything black, I added the little tags found HERE. We made the gun so it could be disconnected from the pack, so he could still wear it to his school party. Our church had a Halloween Party last night and he won the costume contest. His excitement made all my work worth it. Here is a list of parties I'm linking to. seriously THE coolest costume ever! WOW! he looks like he means business. Those ghosties better watch out! love it-all that time and hard work paid off! Great job, a first price prize well deserved! He looks so happy! All right Macgyver you just impressed my hubby and let me tell you he is not easy to impress. I love it, PERFECTION. This had to be so much fun to make, he is going to be the talk of the town. This is awesome Kalleen - so well done! awesome!! I was just working on my little guy's last night. He is going to be an excavator (yes, like a construction machine). Hopefully next year he will pick something a little easier!! That is great! What a fun costume and you did a great job! Porter wants to be a ghostbuster now for Halloween. We'll see how that goes... I might be calling you later tonight. Did you get the American girl email i sent you? Wow. This is incredible. Way to go super mom!! Submit it in my Handmade Halloween Contest - starts now! That is such a cool costume! I really love how you made the jumpsuit!